Knitting is a fun and rewarding textile art that anybody can learn. It can be used to create one-of-a-kind articles of clothing, accessories, and even soft toys. Though knitting is traditionally done with two or more needles (discover the best knitting needles), nowadays knitters also have the option of creating custom textiles with manual or fully automated knitting machines. These devices can be used to produce either flat or tubular knitted fabric, and they vary in their complexity, working via hand-manipulation in some instances and electronic pattern-reading technology in others. For your perusal, here are the updated top ten best-rated knitting machines available on the market today. Whether you’re a beginner taking your first machine out for a spin or a more advanced knitter, we guarantee that there’s a device here that will suit your unique needs. 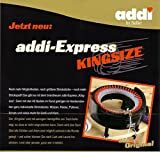 As its name implies, the Addi Express King-Size Knitting Machine is ideal for creating larger pieces of knitted fabric. It’s designed to be mounted onto a tabletop for maximal anchorage and usability. The speed of the 46 numbered pins can be accelerated and decelerated as needed, allowing you to produce a huge range of hats, scarves, and similar handicrafts, and the built-in electronic row counter gives you optimal control over the precision of your work. The machine measures 10 x 6 x 10 inches all around and weighs a mere five pounds, making it second to none in terms of portability. 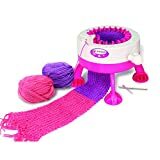 Overall, users of this knitting machine found it highly satisfying, durable, versatile, and easy to operate even for beginners. It’s one of the pricier machines on our list, but you can rest assured that you’re paying for quality when you buy this one. Yes. The Addi Express currently enjoys a 4.5 star our rating and overwhelmingly favorable reviews. Weighs only five pounds, making it easy to transport so you can knit on the go. Designed to anchor to a table or countertop so you can work without the machine shifting. Fully automated for speed and ease of use. Some users felt that the handle used for cranking the machine wasn’t as ergonomic as it could have been and put unnecessary strain on their arms. The machine can only do stockinette stitch, which means the user is somewhat limited in the types of products they can make. Unlike the Addi Express, the officially licensed NKOK Singer Knitting Machine is fully manually operated rather than battery-powered. 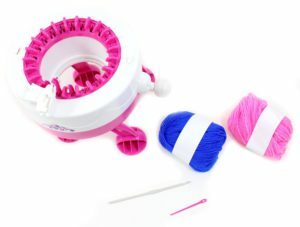 Simply by looping yarn through the machine and turning a crank, the user can make their own accessories including hats, scarves, and legwarmers. The machine measures only 5.8 x 11 x 8.5 inches all around weighs an incredibly lightweight 1.7 pounds. Since it has no electronic moving parts, it can be safely packed and taken anywhere. It also comes with two skeins of yarn and project instructions suitable for beginning users. This machine’s ratings are positive overall, and users report that it takes little time to complete a project. An adult cranking steadily for about 20 – 30 minutes can produce a sock made from a single skein of the enclosed yarn — hours less than it would take to knit one sock using traditional knitting needles. Yes. Specifically, this knitting machine is ideal for younger users. Since it’s hand-powered rather than battery-operated, it can be safely used even by younger children without fear of injury from rapidly moving parts. Very young kids may need some help looping the yarn through the machine, but the cranking process is very simple and can be done without constant supervision. Small, extremely lightweight, and highly portable for use on the go. The lack of electronic moving parts means it’s safe for use even by young children. The machine is fully manually operated, which means users will have to do more to make the same items an electronic machine can produce with less effort. Unlike the first two knitting machines on our list, this one is designed specifically with children in mind. 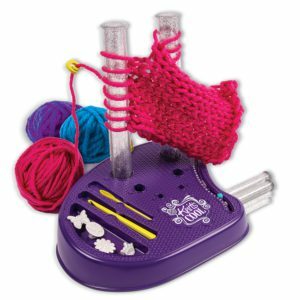 Intended for ages 6 and up, the PowerTRC Smart Weaver allows young users to knit flat or in the round. The machine comes with two skeins of yarn, a crochet hook, a child-safe darning needle, and an instructional booklet. Younger children may need some assistance threading the spindles at first, but they can easily crank it themselves. Some users found that the machine occasionally dropped stitches, though whether that’s a fault of the manufacturing or incorrect usage is hard to say. Some also found the enclosed instructions confusing and had better luck teaching themselves to operate the machine with video tutorials. Overall, however, the consensus was that the machine works as advertised. Yes, with the caveat that it’s intended for children and therefore not of the same grade as the other professional-quality knitting devices profiled here. More experienced users will probably want to choose a different machine for themselves. Specially designed for use by children, making it ideal for younger users. Under $20, making it one of the most affordable machines on our list. Some users found the instructions challenging. Some users reported the machine dropped stitches, though this may also be due to misuse. The Knit’s Cool Knitting Studio is built differently than the other machines on our list and allows the user to make different sorts of textiles. 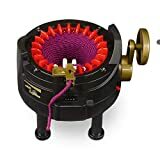 Whereas other knitting machines involve multiple needles arranged in a circular formation, operate with a hand-crank or battery power, and lets the user make either flat or circular knit pieces, the Knit’s Cool works by allowing the user to loop yarn over two upright posts. 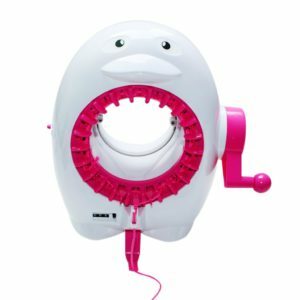 This machine comes with a total of three posts you can use interchangeably to produce three different knit looks, as well as all the materials necessary to create an infinity scarf, and headband, and a phone case. You get a total of fifty yards of yarn in three different colors, plus an assortment of buttons and charms for decorating your creations. The Knit’s Cool website also features numerous video tutorials to assist with the learning process. The main thing to note is that the Knit’s Cool performs very differently from any of the other knitting machines on our list. It’s structured and operates in a completely different manner, which means its performance can’t really be compared to any of the other items we’ve reviewed. 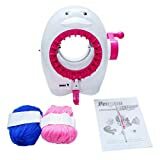 Nevertheless, for young beginning knitters and those who take pleasure in the manual aspect of knitting, this machine will be a winner. It’s a more involved process than simply cranking or turning on a machine. 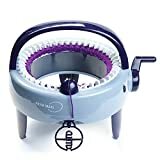 Yes, we recommend this machine particularly for those who like to take a more hands-on role in knitting with a machine. For those who value the automated aspect of other machines, this probably isn’t the best choice. However, those who enjoy more manual knitting will have a lot of fun with it. Knit Cool’s website offers plenty of instructional videos to guide young knitters through the learning process. For those who enjoy more hands-on knitting, this machine will be preferable to its competitors, as it’s entirely manual in nature. Unlike some of the other machines profiled here, the Knit’s Cool comes with not only yarn but decorative buttons and charms you can use to personalize your creations. If you value the automated aspect of some of the other machines on our list, this is not the one for you. It’s a more involved and time-consuming process than simply flipping a switch or even cranking a machine by hand. Most of the other machines on this list allow users to make smaller knit items with a partially or fully automated device that works faster than you can knit with traditional needles. In contrast, the Ultimate Sweater Machine produces an astonishing 1200 stitches per minute, approaching near-industrial levels of speed and output. With this device, you can make an adult-size sweater in a matter of hours, or even a full-size blanket in almost no time at all. It comes equipped with six key-plates corresponding to every knitting needle size 6 – 10.5 and is capable of producing a huge variety of stitch types. 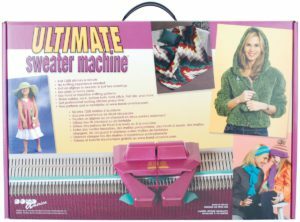 If you peruse the online reviews, you’ll see that the Caron Ultimate Sweater Machine has many more critical reviews than any of the other machines on our list. Many users complain that it does not work as advertised, and that they struggled with dropped stitches and rows, as well as inconsistent tension. Some also complained that the carriage got stuck. However, others report that once they adapted to the machine’s idiosyncrasies, they were able to make it work with little difficulty. We recommend this device with the caveat that you will probably have to learn through trial and error how to operate it successfully. If you have the patience to discover its ins and outs you’ll achieve better results than if you simply follow the instructions to the letter. Allow the user to produce up to 1200 stitches per minute, cutting the time it takes to knit large items down dramatically. Weighs only ten pounds, so you can easily transport it anywhere to knit on the go. This isn’t a knitting machine like most of the other devices on this list. It’s more like a loom, and it requires a fair amount of manual labor. The online reviews are pretty critical, with many users complaining of dropped stitches, poor tension, and dropped rows. However, those who persisted through the initial challenge say they eventually did catch on and get the machine to work. It produces 40 stitches when knitting back and forth and 44 when knitting in the round, and can be used with most yarns intended for hand-knitting. Do note that the yarn weight will affect the tension. The mill works by dropping the end of a length of yarn into the center and then turning the crank. 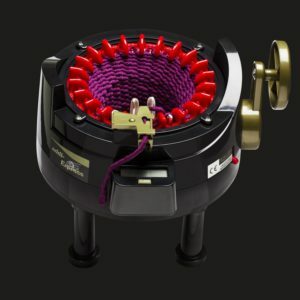 This allows the machine to grab onto the yarn, causing each latch hook to open and close and loop the yarn through. Some users have found that it’s best to start out slowly to avoid tension problems and dropped stitches. Users report that it’s sturdy and well-built and offers comparable quality to the Addi for a much lower price. Sturdy and durable for years of use. More affordable than some of the other professional-grade knitting machines on our list. You may have to operate the machine slower than you’d like to ensure that it doesn’t drop stitches or adversely affect your tension. The Embellish-Knit is a special inclusion in our list because it’s intended primarily for making decorations for your knit garments. The hand-cranked design allows you to wind your own decorative cords, frogs, and other closures. 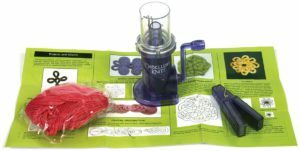 It allows you to knit up to 18′ of decorative cording in only ten minutes, and comes with all the yarn and other materials you need to create your own knitted embellishments. However, as long as you go slowly and are attentive to your work, you should have little difficulty producing your own decorative cords and closures in no time at all. 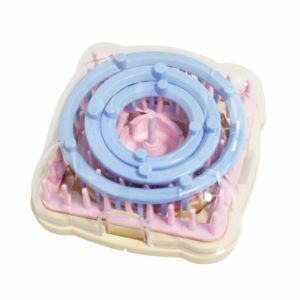 This machine is ideal for created knitted embellishments to help you add a unique, personal touch to your homemade garments. There are video tutorials available to help facilitate learning. Device comes equipped with all the materials you need to make your very first projects. If you hit a snig, the machine can be difficult to untangle. This machine doesn’t make knitted garments, only decorations for garments. This handy loom set allows the user to create fun and colorful knitted embellishments for their textile creations. Six interchangeable loom sizes allow you to make a variety of items to decorate your clothing, hats, and scarves. It’s also not ideal for use by children for this reason. Each of the six interchangeable looms fits into the base and can be swapped out as needed to change the dimensions of whatever you’re making. It takes a variety of weights of yarn. We recommend this knitting loom specifically for adult knitters who will be able to handle it delicately. Comes with six interchangeable looms allowing you to make knitted items of different sizes. Does not come with any patterns. This device is delicate, so it’s not ideal for use by children. 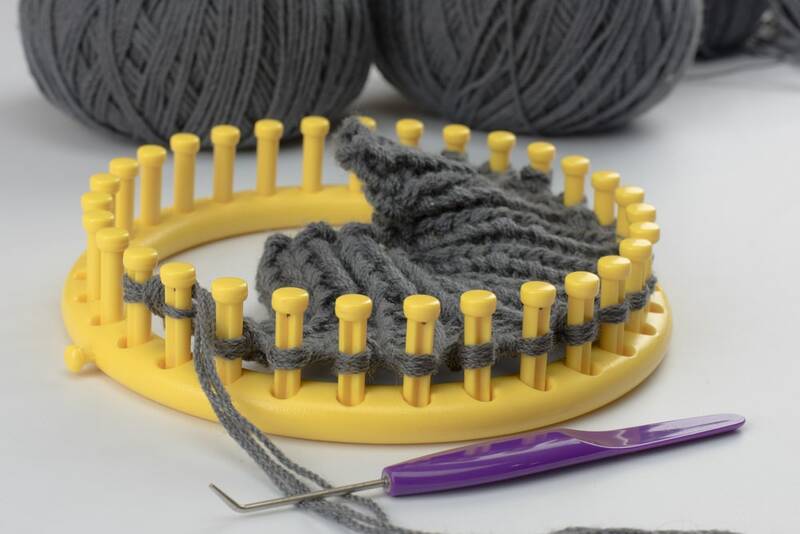 It’s equipped with 22 needles that allow you knit flat or round pieces, comes with a pattern book, hook, replacement needles, a threading tool, and an assortment of other accessories, and also provides instructions suitable for beginning knitters. Like some of the other machines on our list, some users have complained that this one drops stitches. As with the others, we recommend taking it slowly at least to start to reduce the risk of tangling or dropping stitches or rows. If used correctly, you should be able to produce yards of knitted material in a short amount of time. This machine probably isn’t ideal for very young or beginning knitters, but those who are accustomed to using a knitting machine will find this one easy to operate and capable of producing high volumes of knitted material. 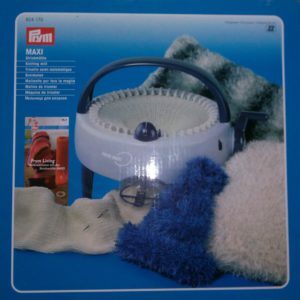 Professional-grade knitting machine that allows you to create yards of material. Solidly built for years of longevity. Not ideal for beginning or very young users. The Dovewill Creative Loom is a standout on the list for a very charming reason: it’s shaped like a penguin! 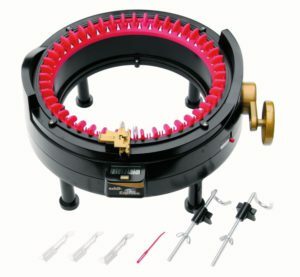 This hand-cranked machine lets users make tubular scarves, socks, and other items via plain or loop knit. It’s made of sturdy plastic and intended for children, but should only be used with adult supervision to avoid injury from the sharp moving needles. The loom is fully manually operated and doesn’t take batteries. It stands upright and can be anchored to a table for added stability, and it can take yarns of many different weights, though the weight you use may affect the tension. 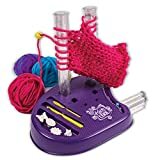 We recommend this knitting loom for any beginning knitters or those who enjoy the process of hand-cranking knitted items. Appropriate for use by young children and the young at heart. Shaped like a penguin if that’s something you’re into. Manually operated, so if you’re looking for something battery-powered that will work faster, you might prefer a different device. The age and experience level of the user. The types of items you wish to make. The frequency with which you expect to use the machine. Needless to say, a very young or beginning user will probably fare better with a knitting machine tailored to their skill level than one of the professional-grade devices we’ve included on our list, so keep the skill level of the intended user in mind before making your purchase. Also, be sure to ask yourself what types of knitted goods you want to make. Are you interested in knitting smaller items like socks or scarves? Or do you want to make larger pieces like sweaters or blankets? Consider the limitations of the machine you buy in advance. Finally, it’s important to keep in mind that machines intended for young and beginning users will not stand up to continued use the way more durable, professional-tier machines will, so if you plan to use it regularly to produce a high volume of knitted items, you’ll probably get better results from investing a little more in a pricier machine that will stand the test of time. Machine knitting is placed in a certain location. Its size and weight depends on the material to knit. Therefore, it might need an ample space. Hand knitting, on the other hand, can be brought anywhere and does not use a huge amount of space. In terms of speed, hand knitters will take more time to finish their craft since they need to make sure that every stitch they make is full of consistency and of the same pattern. Because of its automatic features, a knitting machine can obviously create a huge number of stitches at a certain point of time, without even worrying about the consistency of its pattern. A hand knitter can come up with her own stitching patterns, or design her craft in the middle of the activity. Machine knitters, on the other hand, have a limited capability when it comes to patterns, yet, one can still design the craft afterwards. Complex designs can be made both in hand and machine knitting. However, if you are not that good in hand knitting, yet you wanted to create an admirable, multi-colored garment with a complicated pattern, machine knitting can be a great help for you! Although since it is a machine, there’s a limited capability for it; so better look for the perfect one that will suit your desired knitted items. Aside from being portable, hand knitting also calms the mind with the serenity of its sound. Machines can produce loud sounds while stitching. Yet, there are some products that have a minimal sound that isn’t that disturbing. In hand knitting, as long as you practice your craft, you’ll not just develop your skills, but you’ll also be able to come up with any knitted material you prefer to create. Whereas in machine knitting, each yarn and item of different weights and class require a specific device to use. A huge amount of money might be needed to invest in a knitting machine, whereas in hand knitting, you only need to buy a pair of needles and a yarn. There are numerous knitting machines available on the market today, and regardless of whether you’re a novice knitter or a seasoned pro there is one that will suit your needs. We hope this guide has allowed you to narrow down the range of possibilities and given you pause to consider your needs before you make your purchase. Happy knitting!